"My mother in-law covered me and my husband poured fuel over me and then they set me on fire." 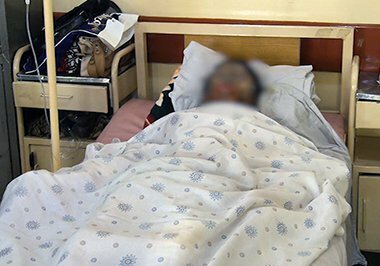 A woman in PD 1 district in Kabul city said on Friday her husband, his sister and her mother in-law poured fuel over her and set her on fire. The victim, Rahila, said the incident took place on Thursday in the street in front of people. Rahila, who is currently being treated at the Istiqlal hospital said: "My mother in-law covered me and my husband poured fuel over me and then they set me on fire. I was screaming and the residents came and put the fire out." "She has second and third degree burns and the patient's current condition is satisfactory; but the patient also has respiratory burns," said Sayed Ishaq Tahiri, a doctor at the hospital. Rahila's relatives said that after her first husband died, she married Samir - about eight months ago - but the marriage was fraught with domestic disputes and conflict over money. 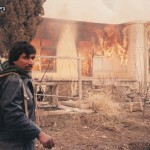 "We want the government to set fire to the perpetrators, the same way they torched Rahila, so this does not happen again in future," said Nawab, Rahil's brother. "They beat my mother just for money and they did this to my mother," said Shukrana, Rahila's daughter. But Samir, who is Rahila's husband, has denied the accusation in a telephone interview with TOLOnews. "My wife came and said she will sit fire to herself and me and during this conflict she poured fuel on herself and me and finally she set fire to herself and then ran and people thought I had torched her," said Rahila's husband, Samir. Rahila's relatives said that all three accused by Rahila of the crime are still free. Kabul Police Criminal Investigation Department Head (CID) said that police are trying to find them in order to arrest them.